Hispaniola is the last malaria endemic island in the Caribbean. On World Malaria Day, Haiti declares it is ready to beat malaria – malaria elimination in the Caribbean is within reach. Port au Prince (April 25, 2018) – Today, the First Lady of Haiti Martine Moïse and more than 300 government officials, civil society representatives, scientists and technical partners of the global health and development community gathered to celebrate World Malaria Day and increase awareness of Haiti’s commitment to eliminating malaria, a preventable yet deadly disease that threatens half the world’s population and kills a child every two minutes. In addition to causing severe illness and death, malaria has a negative impact on Haiti’s already fragile economy, exacerbating poverty, decreasing productivity, slowing progress in a country where more than half of the population already lives on less than U.S. $2.44 per day. Yet, Haiti and its partners are committed to eliminating malaria by 2020. With the right resources, partnerships and momentum, the Caribbean can be a malaria-free region, thus bringing the world one step closer to global elimination. 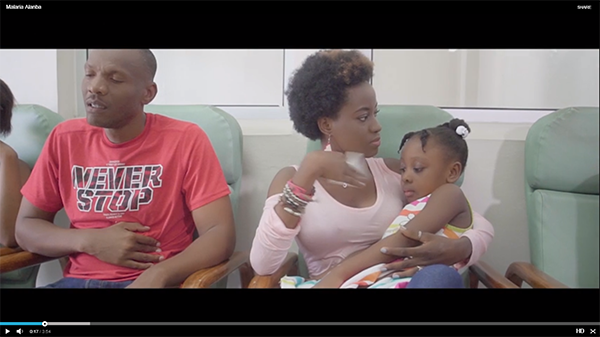 To commemorate World Malaria Day, a special malaria health education video was created by the Haitian Ministry of Public Health and Population (MSPP) together with The Carter Center, as part of the Malaria Zero Alliance of partners. This video, titled “Malaria Alanba” (Malaria Go Down) brings together seven of the top performers in Haitian popular music and airs on television and radio stations across Haiti today. Earlier this month, Haiti’s MSPP Minister Dr. Greta Roy Clemen appointed musician and “Alanba” contributor Mr. Michael Benjamin, aka Mikaben, to be the country’s first Goodwill Ambassador for Health. The health promotion music video can be viewed here. Hispaniola, which includes Haiti and the Dominican Republic, is the only remaining island in the Caribbean where malaria is still endemic. According to the Pan American Health Organization (PAHO/WHO), Latin America and the Caribbean have made significant progress in curbing the burden of malaria since 2000. Currently 20 of the 21 malaria endemic countries in the region have committed to end this disease for good. Today, 109 million people in the Americas are still at risk of contracting the disease, and approximately 7 million are at a high risk. "Elimination in Hispaniola is within reach," said Margaret Reilly McDonnell, Executive Director of the United Nations Foundation’s Nothing But Nets campaign. "Increased focus and funding on global elimination is critical, and we applaud the efforts of the country of Haiti toward ensuring that no one dies from a mosquito bite." Bi-national cooperation is crucial to achieve island-wide malaria elimination. Last year, a binational project to eliminate malaria in Hispaniola, spanning border communities of Ouanaminthe (Haiti) and Dajabon (DR), received the Malaria Champion of the Americas award by PAHO/WHO for its "outstanding achievements" and creative response using innovative technologies that involve the private sector and community and traditional health workers to improve surveillance, diagnosis and treatment of malaria in both countries. "Haiti’s progress toward malaria elimination demonstrates its commitment to saving lives," said Josh Blumenfeld, Managing Director for Global Policy and Advocacy, Malaria No More. "Eliminating malaria from Haiti would be an enormous victory, freeing the country from the burden of this disease, and accelerating elimination in the Americas. On this World Malaria Day, we are inspired by Haiti’s leadership and the collaborative efforts from all partners working to rid Haiti of malaria." Building upon the binational project success, the Malaria Zero Alliance, led by the MSPP’s Programmes Nationaux de Malaria et de Filariose Lymphatique (PNCM) in Haiti, is focusing efforts in Grand’Anse. Malaria Zero has prioritized Grand’Anse due to its disproportionate burden of malaria transmission, accounting for more than 50% of malaria cases nationwide. Activities to ensure all cases of malaria are tested, tracked and treated are now underway in five initial communities (Les Irois, Anse d’Hainault, Dame Marie, Chambellan, and Moron) and anticipated to expand to the entire department in 2019. Great strides have been made toward malaria elimination; success in Grand’Anse will significantly reduce the overall malaria burden in Haiti and lessons learned will serve as a guide for Haiti to reach its goal of a malaria free Haiti by 2020. Today’s event was co-hosted by United Nations Foundation’s Nothing But Nets campaign and Malaria No More, in close collaboration with the Malaria Zero Alliance. Nothing But Nets and Malaria No More have partnered with Malaria Zero to mobilize additional resources and momentum to end malaria in Haiti and the Dominican Republic. More partnerships and resources are required to end malaria for good. For more information about malaria elimination efforts in Haiti, visit www.malariazeroalliance.org. Malaria No More envisions a world where no one dies from a mosquito bite. More than a decade into our mission, our work has contributed to historic progress toward this goal. Now, we’re mobilizing the political commitment, funding, and innovation required to achieve what would be one of the greatest humanitarian accomplishments – ending malaria within our generation. For more information, visit www.malarianomore.org. Malaria Zero is an alliance of partners with one bold goal: to accelerate elimination of malaria from the island of Hispaniola. Malaria Zero partners are implementing innovative, evidence-based strategies, including identifying and fine-scale mapping of areas of high transmission and risk, and piloting novel, targeted approaches to elimination. Malaria Zero was made possible by a $29.9 million grant from the Bill & Melinda Gates Foundation, but at least twice as much more is still needed to ensure that our team of technical experts is able to implement island-wide strategies to achieve malaria elimination. For more information, visit www.malariazeroalliance.org.